Showtime's new show, The Borgias, will begin filming this summer and will air in Spring 2011. 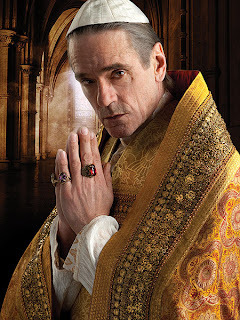 Zaptoit has posted the first picture of Jeremy Irons os the patriarch of the Borgias, Rodrigo (Pope Alexander VI). I think he looks great and I am so excited for this new show! Can't wait! This is going to be awesome! I don't know anything about the show, but he looks kind of intense and creepy. Oh I'm so excited about this too! I'm really looking forward to this one - now I can't cancel Showtime! Looks a lean and ascetic pope! oh wow! jeremy irons is fantastic. Can't wait for this even though I wish they would have continued the Tudor story with Edward/Mary/Elizabeth. He is perfect! Look at that creepy skin crawling look he is giving. Excellent actor.